Review Just like Apple iPhone users needn’t own a Mac to sync data and apply updates, Windows Phone 7 users needn’t be reliant on a PC either. To broaden the appeal of Microsoft’s latest handset OS, the company offers a Mac software alternative. Nice to know there's an update, but what version is it? Unlike Apple’s dual platform iTunes offering, MS keeps Zune exclusively for its PC clientele and Mac users get Windows Phone 7 Connector. It’s even available to download from Apple’s Mac App Store. I’ve been using this Mac app with an HTC Trophy, eagerly awaiting the opportunity to update it to Windows Phone 7.5, aka Mango. The other week, I thought it had arrived early, but this was just an update to version 7.0.7008.0. As far as installing goes, it all went smoothly. Download, instal, reboot – that sort of thing. The only grumble I had with the experience is that Windows Phone 7 Connector for Mac doesn’t actually inform you of the update revision number that you’re applying. You’re flying blind. And it was only at the end of that particular update process that I realised that Mango hadn’t ripened yet. 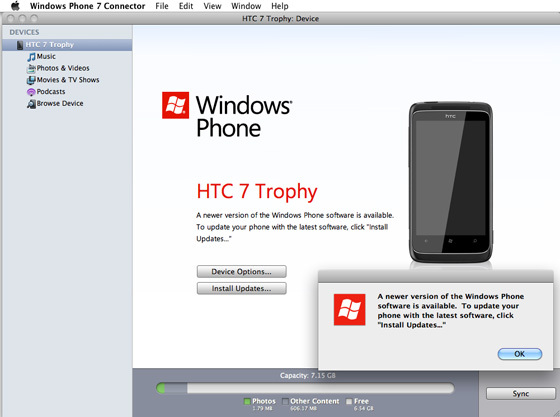 Maybe it’s another app causing trouble, but one thing seemed certain, getting a recent Windows Phone 7 update onto my HTC Trophy wasn’t going to be happening with Windows Phone 7 Connector for Mac.